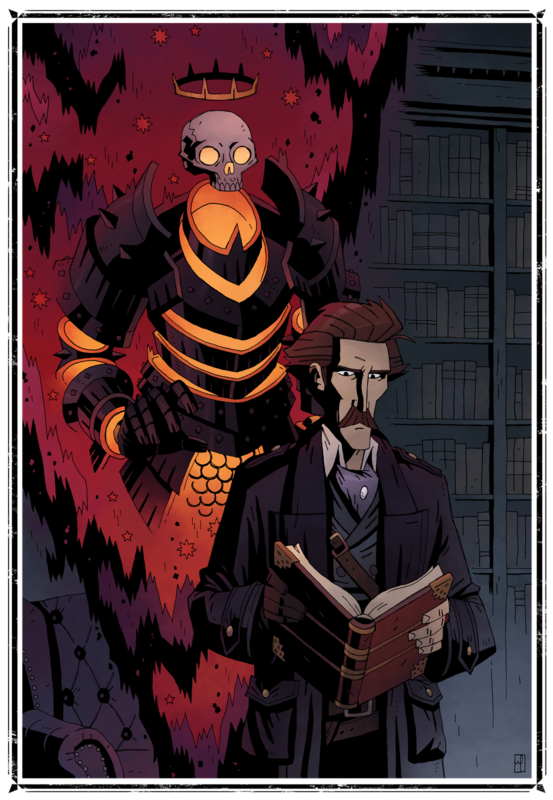 Carnacki in “The Reading Room” | Who Killed Orrin Grey? The story is “The Reading Room,” which first appeared in Bound for Evil from Dead Letter Press, and which will be reprinted in my collection Never Bet the Devil & Other Warnings. It’s a favorite of mine, so I was really thrilled when Corley decided to use it as a point of departure for his latest Carnacki drawing. If you don’t follow me on Google+ or Facebook or other such places, this may be the first you’ve heard of Corley’s version of Thomas Carnacki. Basically, Corley has been drawing his own version of William Hope Hodgson’s famous paranormal investigator in a series of incredible pin-ups, some of them drawn from Hodgson’s own Carnacki stories, some from other classic weird tales, some just from Corley’s own imagination, and, of course, one from my own tales. To say that this was a big thrill for me would be the worst kind of understatement. If you’ve not seen Corley’s earlier Carnacki pieces, you can see them all here.